Let's hope you didn't just pay for Apple's iWork software. Apple announced today during its new iPhone event that the iOS app are going to be free for all new iOS devices. This suite includes the formerly paid apps Pages, Numbers, Keynote, iMovie and iPhoto on the iPhone and iPad. Pages, Numbers and Keynote cost $9.99 each (£6.99, AU$10.49 each), and iMovie and iPhone are priced at $4.99 each (£2.99, AU$5.49 each). That's a savings of $39.95 (£26.95, AU$42.45). While Apple didn't specify which iOS devices it considers "new" at today's event, iOS 7 is compatible with iPhone 4 and up and iPad 2 and up, and it's likely that it the free iWork apps are going to follow the same route. 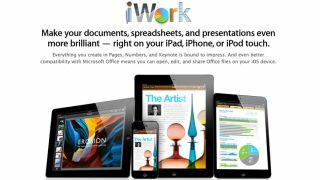 By completely dropping the price of iWork, Apple is boldly taking on the work productivity software of competitors like Microsoft. Sure, Office Mobile launched on the iPhone earlier this year and Microsoft has been hammering Apple in productivity-focused iPad 4 vs Surface tablet ads recently. However, Microsoft's Office app still requires an Office 365 subscription. Apple's iWork software is going to be free and, like the iPhone camera, the world's most popular camera right now, it could hook a lot of iOS users who have never tried it before.